All Crystal Lake South Hockey Club players need to have completed sports physicals prior to the start of the 2018-2019 season. 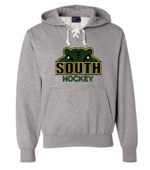 If your hockey player is involved in other sports at Crystal Lake South High School and you submitted the sports physical information online through the school's new athletic website, your player is covered. If hockey is your child's only sport, you need give the Crystal Lake South Hockey Club a copy of the completed sports physical form - signed by your physician, you and your child by the start of the season. Doctors typcially have sports physical forms, or you can download the Illinois High School Sports Physical Form below and bring that to your child's sports physical appointment for your doctor to complete. You do NOT need to register through the school's new athletic online website if hockey is your child's only sport. Incoming freshmen are required to get standard physicals to attend high school, but you must request the sports physical as well.